Bologna has earned a well respected reputation for its ancient culinary traditions namely hand-made pastas and Ragú alla Bolognese (red meat sauce). This school precise objective is that of high respect for region cultural and social traditions, within the food and wine appreciation. The school is preserving those traditions that have been passed down from generation to generation and improve them with modern techiniques and ingrediens in a way that the old con be blended with the new for a wider ad always more demanding gourmet audience. 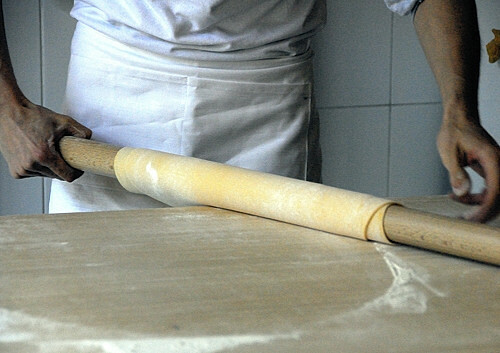 With this class you can learn how to make the real sfoglia which is the trademark of the Emilia-Romagna region, and see how they make tortellini, tortelloni, tagliatelle, and lasagna. See photos from my recent Bologna cooking classes. Dinner to taste the prepared dishes. Transfer from/to hotel, airport, train station. €95, per person, based on double on a minimum of 2 participants. Not Included: transportation, drinks, tips, anything not specifically indicated in the “package includes” sections.